- Perfect for your morning coffee, tea, or any type of hot liquid, this well crafted cap allows you to easily carry your beverage of choice with you on the go. - The sports lid's easy flip up design with straw is perfect for anyone with an active lifestyle. Just flip it and sip it. Great for hiking, the gym, or for who just needs easy access to their beverage. And with its unique O shaped design you can hold it or attach it to any carabiner making it an easy transport. you never have to worry about losing it or having to use both hands to access your beverage. extreme portability so no matter what your beverage of choice is you can take it with you no matter where life takes you. as many dogs as possible. - We Will Cover A Lifetime Of Lids For You! Since Life Flask offers a lifetime warranty on all lids, you never pay for lids EVER again! COLD FOR 24 HOURS / HOT FOR 8 HOURS - The LifeFlask Insulated water bottle uses a vacuum insulated technology allowing drinks to be able to maintain their temperature no matter what the exterior temperature is. 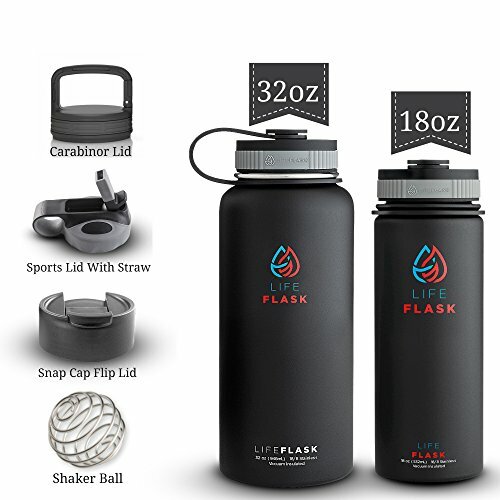 COMES WITH 3 LIDS & A SHAKER BALL (Carabiner lid, Sports Lid, Snap Cap) No matter if you're drinking coffee in the morning, working out or hiking, or at your kids sports game you'll be covered. If you have any questions about this product by Life Flask, contact us by completing and submitting the form below. If you are looking for a specif part number, please include it with your message.